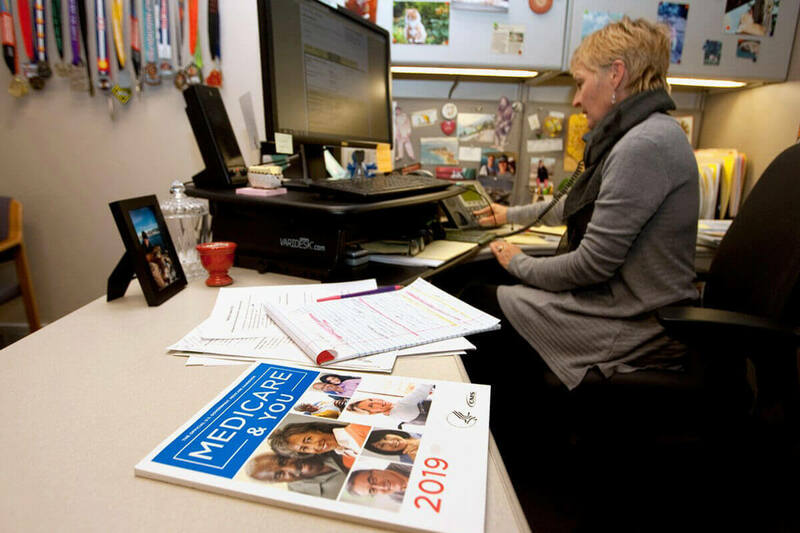 UCHealth Community Health Improvement’s Aspen Club has state-trained counselors providing Medicare help through the State Health Insurance Assistance Program. Kim Ferro, community health coordinator with UCHealth in northern Colorado, helps a client over the phone with their Medicare questions. Through UCHealth Aspen Club, counselors assist people, free of charge, with their Medicare benefits and help to objectively answer questions. Photo by Joel Blocker Photography, for UCHealth. If George Montoya doesn’t take his medication daily there are life-threatening ramifications. When he arrived at his pharmacy to pick up his prescription and was told that it wasn’t covered by his insurance, Montoya started to panic. “If I don’t have it within 24 hours, I’m dead,” he said. Montoya, who recently turned 65, had a benign pituitary tumor removed in the early 1980s. As a result, he’s on medication to help his heart, liver and thyroid function properly. He recently switched from Medicaid to Medicare. Medicaid no longer paid for his medications, and his Medicare prescription drug plan through an insurer became troublesome at the pharmacy. The issue that day was that Montoya recently moved. He had not noticed that that his bill hadn’t arrived at his new home in Estes Park. Because he hadn’t paid his premium, his prescription insurance was canceled. Without it, his lifesaving medication was going to cost him a few hundred dollars. “I’m 100 percent disabled on a meager income,” Montoya said. Montoya is a pastor and has volunteered for the past two decades at many area ministries, from prisons to outreach programs. This time, though, he needed help. After a phone call or two, Montoya found Kim Ferro, community health coordinator with UCHealth in northern Colorado. UCHealth Community Health Improvement is a designated site for the State Health Insurance Assistance Program, or SHIP, in Larimer and Weld counties. Through the UCHealth Aspen Club, counselors assist people, free of charge, with their Medicare benefits and help to objectively answer questions. Montoya left a message with the office. “His call sounded so desperate, and I was thinking how I had to call this gentleman right back. But I think in his panic, he forgot to leave his number,” Ferro said. After a bit of searching, Ferro was able to find Montoya’s number and spoke to him on the phone. As a SHIP counselor, she was able to log into Medicare and discuss with him his plans and coverage. And with a bit of investigative work, she got him the help he needed. Ferro sees all sorts of similar situations. UCHealth Aspen Club offers community members one-on-one appointments with counselors trained through the state. Appointments take place over the phone or in person. If new to Medicare, Ferro suggests one should start with a Medicare 101 class, a 90-minute, one-time presentation offered monthly January through October at UCHealth locations in Fort Collins, Loveland, Greeley and Estes Park. During the annual open enrollment period from Oct. 15 to Dec. 7, people can set appointments to review their prescription and Medicare Advantage plans.